On today’s show we have Ryan Michler, a husband, father, Iraqi Combat Veteran, and the Founder of Order of Man. Ryan is a familiar voice in Fire and Adjust as I interviewed him a while back in Episode 33 when he was running a very different business. Ryan just got out of high school when he entered basic training and left to Iraq just after getting married. While in the military he spent 8 years in the National Guard. Going back to his wife and kid was difficult. Having had traumatic experiences with different father figures Ryan didn’t know how to be a husband, a father, and a man in his community. His relationship with his wife went plummeting and this forced Ryan to really think about the person he is becoming. Ryan emerged from this journey within himself as a “man” ready to take on a leadership role in his family as father and husband and in his community as a business leader. As he learned and developed the tools to master himself, his passion to help other men in the same journey inspired him to launch Order of Man, an online platform that helps men in four key areas: relationships, health, wealth, and self-mastery. Listen to our conversation as Ryan talks about the work he and his tribe does within their mastermind group called The Iron Council. Learn helpful self-improvement practices that let you plan out your day intentionally and review the things you’ve accomplished to propel you to the next. Ryan also shares his time management principles and strategies that allow him to balance the different roles and projects that he handles. 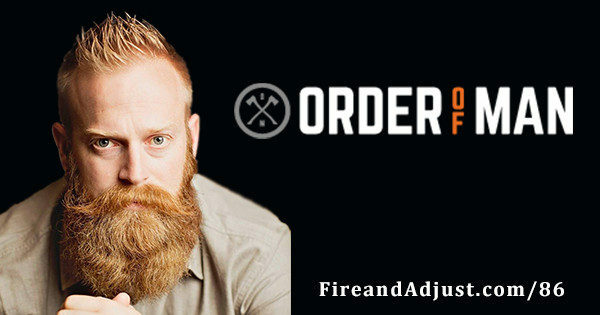 You can listen to all of these and many more in this episode of Fire and Adjust.